Fill out our simple form and get quotes from local big top hire companies. Roll up, roll up… there’s a party about to begin! A big top is bound to bring the fun of the fair to your event. Challenging the plain white of traditional marquees, big tops are a colourful option for a big party! Search big top marquee suppliers here. Big tops are a great alternative to a standard white marquee. With high walls and bright colours, they are ideal for larger or themed weddings. Colourful Big Top Festival Circus Style Marquees for hire, 300 to 1600 capacity tents. Circus style Big Tops available in different colours and designs..
What will you be using the big top for? 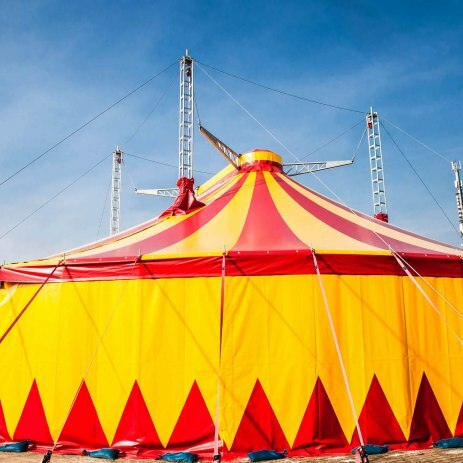 With curves instead of corners and stripes instead of plain white, if you want to be different, hiring a big top in place of a traditional marquee or tent could be a great option for you. Circus big tops aren’t just for the jugglers and tightrope walkers (although hiring these acts would complete the perfect circus theme!) A circus big top can create an excellent hub for your event and for your guests to meet and mingle. Big top hire also provides the ideal space for entertaining with the option to add a circular stage or dance floor right in the centre. To find big top suppliers in your area, just submit a quote request form, or browse suppliers for more information.